“Last night was not a game where you just throw up your hands and say, ‘We don’t get it.’ Sometimes those things happen. Shaun will be out at the 1, for sure, tonight. He’s comfortable there and we have confidence in him there.” — Bucks coach Scott Skiles, talking about point guards and the loss Monday night in Denver. Neither Jennings nor his coach looked as though they “got it” in the fourth quarter in Denver. At minimum, the above comment from Skiles acknowledges that he just might – might – bench Jennings if the point guard plays clueless, and that maybe – maybe- Shaun Livingston might get the call in light of the injury to Jennings’ backup, Beno Udrih. Maybe. Comments like the one Skiles made above had no bearing on the Bucks miserable play in Salt Lake City last night. Jennings shot 4-19 in the Bucks 85-73 loss. 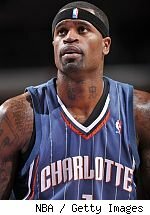 Stephen Jackson, starting again at guard-forward-forward-guard shot 5-17. No, they don’t do enough in other parts of their games to make up for a 9-for-36. This entry was posted in The Jinx and tagged Brandon Jennings, Denver Nuggets, Scott Skiles, Shaun Livingston on January 4, 2012 by J.D. Mo.